A decadent, playful dessert for any occasion! Instead of toasting your marshmallows under the grill, you could also toast them over the coals of a braai before you sandwich them between home-made cookies with dollops of chocolate-hazelnut spread. For the salted chocolate chunk cookies, place the butter, white and coconut sugars and vanilla essence in a medium bowl or the bowl of a free-standing electric mixer. Beat using an electric hand-held or stand mixer until light and fluffy, about 5 minutes, scraping down the sides of the bowl with a spatula, every few minutes. Using a spatula, fold the cake flour and dark chocolate chunks into the mixture until just combined. Place the bowl with the cookie mixture in the fridge until needed. Preheat the oven to 180°C. Line a large baking sheet with a silicone mat or grease and line with baking paper. For each large cookie, scoop out 45ml (3 tbsp) of the cookie mixture and roll the cookie dough into a ball. Place the ball on the prepared baking sheet and flatten out with your fingertips to a thickness of about 1,5cm. Repeat these steps to use up all of the cookie dough. Lightly sprinkle the cookies with a little flaked sea salt and bake in the preheated oven, 10 – 15 minutes or until golden brown. Remove from oven and allow to cool completely. Preheat the grill to medium. Once the cookies have cooled down, remove ½ of the batch from the baking sheet. Place a giant marshmallow on each cookie remaining on the sheet. Place the baking sheet under the grill, about 2 minutes, keeping a close eye on the marshmallows, so as to toast, but not burn. 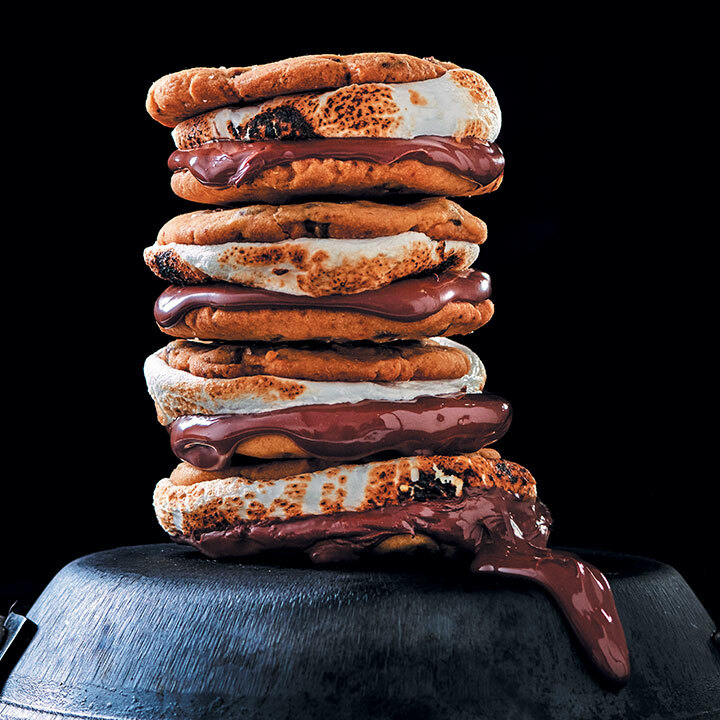 To assemble, dollop chocolate-hazelnut spread on top of each toasted marshmallow and top with another cookie to create a sandwich. Serve and savour!